Add in the salt, pepper, chilies, and milk into the egg. Mix it thoroughly. ( * Add in herbs like oregano if you don’t like chili/pepper even that tastes great. Then add the onion and tomatoes to the mix. Heat a nonstick pan and coat it with oil. 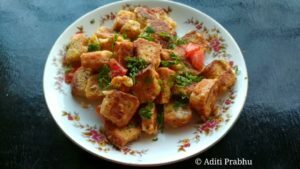 Pour on the bread-egg mix and let it fry till crisp. Serve it with the garnish of coriander.